Order page for Do Not Disturb: Is the Media Failing Australia? A book of essays, edited by Robert Manne - with David Marr, Guy Rundle, Jack Waterford, Eric Beecher, Margaret Simons, David McKnight, Dennis Glover, Quentin Dempster and Jon Faine. Is our media doing its job when it comes to Australian politics? Is it frank and fearless in pursuit of spin and evasion? Why have we entered an era of shockjocks and celebrity commentators? What will changed media rules mean for our public sphere? 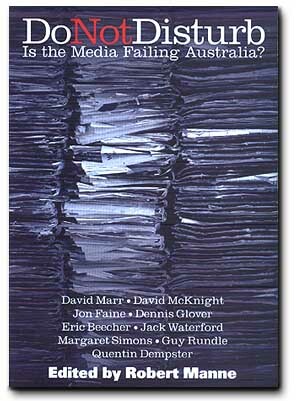 This is a book in which insiders assess the performance and the political influence of the Australian media. It offers a critique of its strengths and weaknesses and is not afraid to point the finger. Its writers are leading media figures who possess unique insights as well as the ability to write a highly dramatic and readable essay. Subtitle: Is the Media Failing Australia? 2. clarification that you'd like to receive Do Not Disturb, and the number of copies you require.